I think Richard has decided I need training to be an Alaskan. He asked for my help on his landing craft again today. So when Arthur and I went into town, Arthur hung out with Jan (Richard's wife and, coincidentally, Arthur's local VA advocate), I spent a few hours with him putting on the port side deck piece over the other engine, which he'd gotten dropped in place. It's a two-person job because one person has to be on each side of the deck (above and below), while the nuts and bolts go through and get attached. Here is the landing craft. The engines are at the back, in the compartment under the cabin canopy at the stern of the boat. 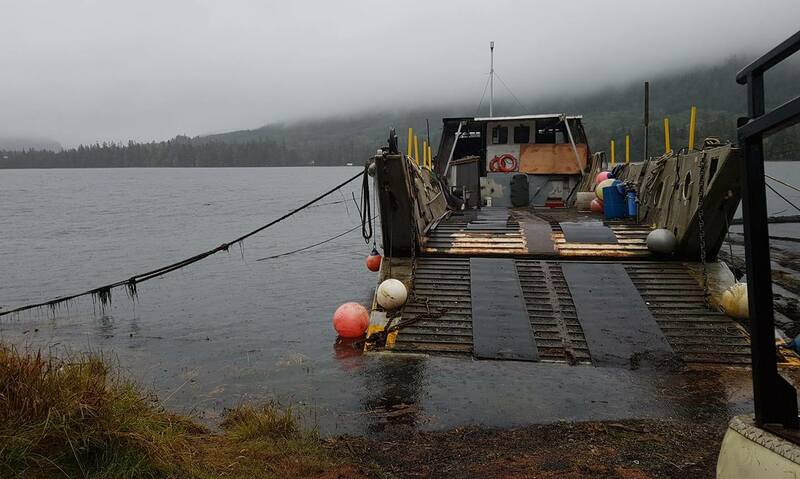 It was raining the whole time we worked, and the tide came in, so that halfway through the work the boat began floating, lending a certain instability to the proceedings.